Perko Fig. 541. 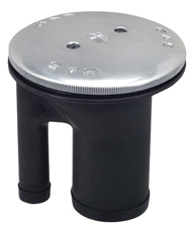 Chrome plated bronze cap with black plastic base. Integral tank vent with flame arrestor and anti surge valve. Straight neck and heavy duty stainless steel bead chain. Fuel hose size 1-1/2". Vent hose size 5/8". Neck length 2-7/16".